Being a chef and a foodie, whenever I travel, I make sure that I explore the area and hunt for local food, good food and comfort food. Learning about the flavors of the region, the authenticity of the food is another thing I do by talking to to the local people there. Over the past few year, not few but many years, I have traveled alot to one destination in India, i.e. Ajmer - Rajasthan. Want to know the reason for the travel ? during childhood, we all must have visited their nani house, so this is the place where my nani (my mothers mother) stays. 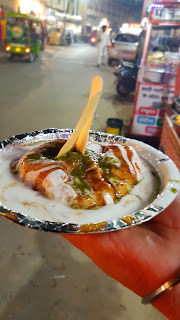 I have always traveled to Ajmer via Railway and the journey on an average is about 18-19 hours, seems a lot but for a foodie like me who likes to travel, there is a lot to see in this 18 hour journey. The food, the greenery and meeting some new people and getting to know them. Even sharing stories with them about their culture and food. This post is not just about one journey I made, but a sum of all the previous that I can remember of. During the whole journey, one comes across various halts at railway stations and some of them are known for their food. As to what I can remember have tried myself, I have noted down what all one can come across. 1. The Vada Pao - its in the first few stops only where you will come across the famous Valsad ka Vada Paos. The vendors bring them to you in the train. Small Vadas served along with some bread rolls and fried chili. The best thing is that, you are on the top berth of the train and the blow from the air conditioner is at full and you get this garam garam vadas to hog on to. The best combination with these is elaichi (cardamom) wale chai (tea). 2. Rabdi - A few stop later you will come across a station known as Abu Road. If this stop comes late evening that is post dinner then the rabdi (reduced milk with some sugar) is the perfect after meal dish that you can have. Abu Road is not only for its rabdi, but the kulad wala dahi as well (curd set in earthen pot). 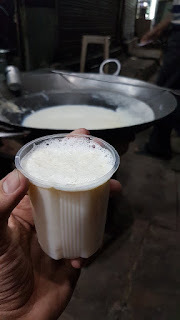 The lachedar rabdi served cold, not so sweet and just heavenly. It is something one shouldnt miss if you have a sweet tooth. 3. Aloo Puri - Falna is the station that comes early morning. If i remember it comes at around 6 am and its one of those places where you can start your day with some delicious breakfast. Get down at the station and grab a portion of this simple potato preparation accompanied by puris, but yet so flavorful. It makes a perfect breakfast. After the train journey, you reach Ajmer and for a person like me there is no resting. I reach home, freshen up and leave the house for a food filled day. In Ajmer, I begin with some local khanna i.e. 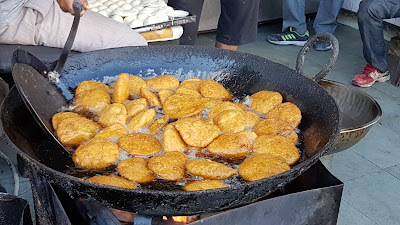 the Kachori and not just any kachori, Jodhpur Sweets ke Pyaaz wale Kachori. Best had when its just fried and given to you topped with the sweet and spicy chutney. 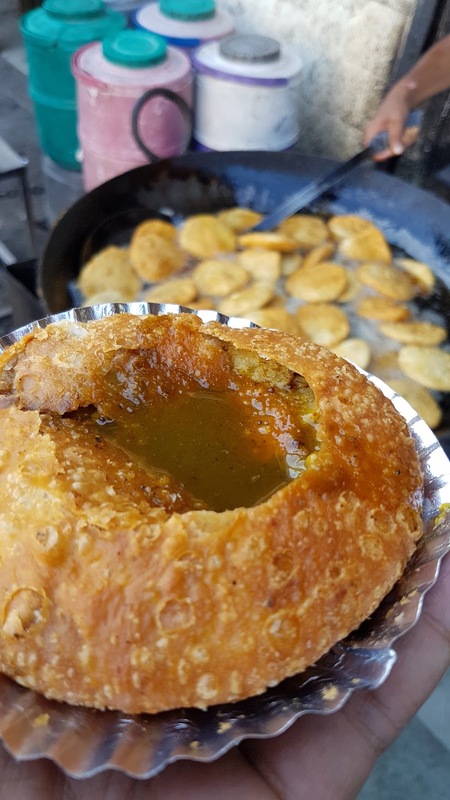 The kachori is crispy, filled with one of the best stuffing I have had in a kachori. 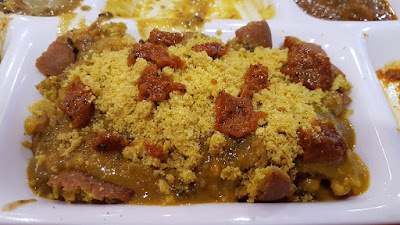 Onions, pea with spices and secret spices enclosed inside a dough made of flour, rolled and deep fried. Not many know this but whenever I visit this place, I parcel more than I eat there and come. In fact I had got close to 10 kachoris parceled to mumbai back with me. This is one place one definitely needs to go, its located a little ahead of the railway station. After some spicy and chatpata khaana, why have some sweet. One of the place I visit in order to fulfill my meethe ka craving is at Rajasthan Sweets in Diggi Bazar. The malpua over here is heavy and filling and sweet and tasty and I can go on and on. 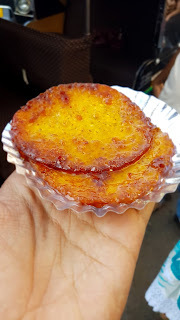 Shallow fried Indian style pancakes made out of reduced milk and mawa after which it is then soaked in thick sugar syrup. At 15 rs a piece is a steal and trust me, you cant stop at one, atleast I cant stop at one. 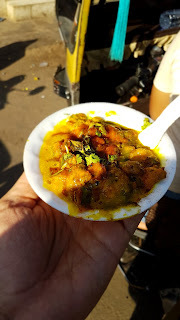 The next stop was the Palak Pakoda Kadhi Chaat at Khandelwal circle. Garam Garam Kadhi served along with crispy. Be careful while eating, its tempting and delicious but do not burn your tongue coz I did burn mine. Flavor wise the combination is a classic one and if topped with some chutney and some masalas, its makes it even better. Again this was at just 15 rs a portion. If you are in Rajasthan, its a mandatory to have the Dal Baati Churma. One of the dishes Rajasthan is know for. Deep fried Baatis with spicy dal, meetha churma and some garlic chutney to accompany it. The traditional way of eating this is with hands. You break the baati, then top it with the dal and then the churma and not to forget the a bowl full of ghee on the top. This was my dinner for that day coz if you have this, then there is nothing else that you can eat. One can find this at many places, but the best ones are inside the houses where the mothers and the housewives make them. 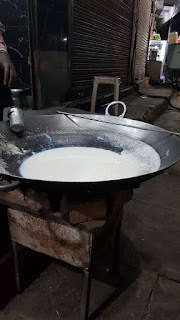 But before going home, there is one more stop that one can make in order to enjoy some amazingly hot, thick milk which is kept on simmer for quite a while. Known as kadhai ka doodh and its best had with the freshly made crispy jalebi. The milk after being poured is topped with the malai (skin formed on top after the milk is boiled). One can find this at again the Khandelwal circle. The next morning, I started with some ghar ka khaana made by my nani but that did not stop me from exploring the food on the streets which I had left a day prior. It started with the aloo tikki chaat at Gol Pyau where Shankar Chaat Bhandar is known for their chaats. Their aloo tikka which was served with a spicy tangy chutney was stuffed with cottage cheese and some masalas. To be honest, I did not like it much, but it depends on person to person. You might like it, so give it a try. Just near the area - Gol Pyau, there is a lane known as Chuddi Bazar (A bazar where you will get variations of Bangles). Over here, there is lane just dedicated just to food, like a khaao gaali. I started off which some light food - Dhai Bhalle. One of my favorites, soft like a pillow and moist. Served along with smooth, flavorful yogurt and then topped with a sweet and a spicy green chutney and to finish it, sprinkle of masalas. One wada being quite huge at just 25 rs per portion will make you want to parcel some for home and have later in the night. Chole Kulche being a specialty of punjabi doesnt mean that you wont get great chole kulche elsewhere. A couple of stall ahead of the earlier Dahi bhalle wala, you will find a counter serving hot chole and kulche. The kulchas are heated and tossed in garlic butter and served along with masaledar chole and the most amazing green chili pickle on top. The kulchas were soft and complimented the spicy chole and the pickle. 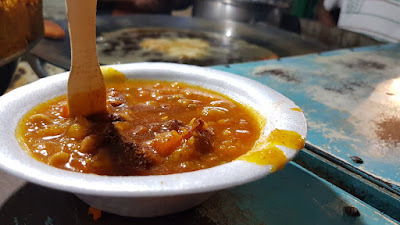 At just 35 rs a plate, it for sure will fill up your stomach and if your a still hungry, there is more, but two plates of this chole kulche wont make a big hole in your wallet. Momos - one of my favorites, I do eat a lot of these in bombay and had to try some in Ajmer as well. It was a bit difficult to find them but after a lot of searching and asking people, there was one truck on the Sri Nagar road. The menu was quite big, there was pasta, everyone's favorite - 2 minute Maggie and chinese and the reason I went there for - momos. 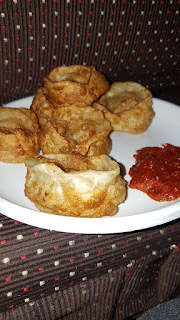 I ordered the fried vegetable momos, they were a bit oily and extremely hot but flavor wise they had that desi touch and accompanied by the spicy schezwan sauce. At 10 rs a piece i.e. 60 rs a plate, it was fair enough but to be honest, I have had better. You can skip this. 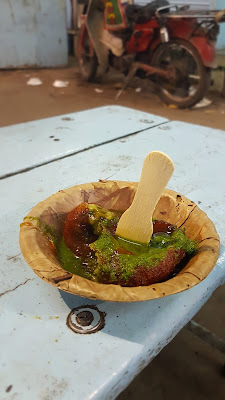 Sheru ke Aloo Tikki Chaat - This was in the top list of street food I had during my this trip and the last previous trips as well. The chaat here is the family favorite and its like a tradition that we have to eat at this place at least once. The taste has been the same and hasnt changed in 5 years is what I can remember. Trust me, you will come back for one more and cant stop at just one portion. At 15 rs a plate, you can have one, two or three. You can find Sheru just on the way towards Ajay Nagar Bus Stop just outside a grocery store (he has been there since inception). Apart from the street foods, there are also some great restaurants that serve amazing food and you can trust a palate of a chef :P.
The city Ajmer is not just about food, there are some places also that one can visit like Pushkar, Dargha, Sai Baba Temple and the markets. 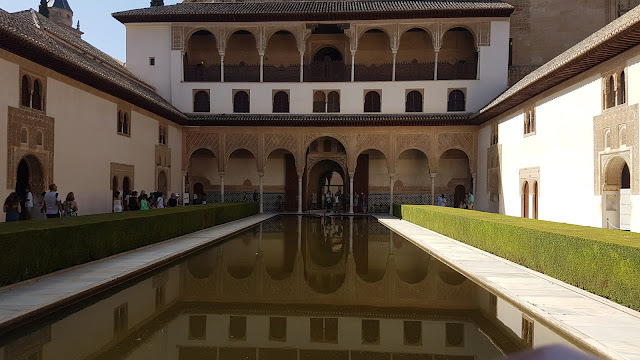 So if you happen to visit the place, roam the city as well and you will surely like it. 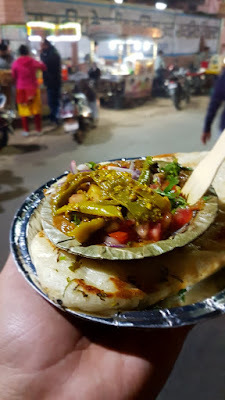 Facebook - The Hungry Bawarchi for the travel and food updates.